We proudly present you some equipment that makes visits at your local body piercing studio a thing of the past. A combination of a tunnel and a matching expander undertake the professional stretching in the easiest way possible. Simply remove the closure of the tunnel and put the tunnel on the expander. Afterwards you can start stretching. 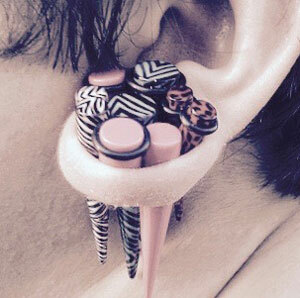 If this is finished you can remove the expander and keep wearing your tunnel. Every set is available in different sizes, bundles and package deals. Stretching your earlobe piercing to your desired size is always a longterm process. You start with the smallest tunnel size which is the 3mm taper. After the healing process is finished, you can go further to the next taper size. For this you will always need a new stretching taper. The best solution to have all the tapers for the next tunnel sizes at home are ear taper sets. These are all in one packages that contain everything you need to stretch your piercing to a larger size step by step. This will keep you motivated with ear stretching and you will save you a lot of money if you buy a complete taper set instead every taper seterately. We offer our ear stretching sets in various versions. The most popular set is the black steel expander set which consits of 8 tapers in all necessary sizes between 1.6mm and 10 millimeters. Also very beloved are the silver coloured surgical steel tapers. These are available in the same sizes like the black ones and will perfectly fit to any outfit. If you prefer very lightweight tapers instead our acrylic taper sets might be the best option for you. They are even more favourable and offer you the carefree package of ear strectching. But by far the most practical stretching solution is our our set of expanders combined with flesh tunnels. With these you do not only have all taper sizes but you also get a flesh tunnel for every single size. This way you get a complete premium flesh tunnel and expander set at a very low price. This set also contans eight tunnels and 8 tapers in all sizes you need to reach 10mm tunnels. If you want to stretch your earlobe even further - no problem we also offer taper sets for larger tunnel sizes. Our bestseller for -the big ones- is our premium surgical steel taper set. It consists of 5 tapers in sizes between 12mm and 20 millimeters and a beautiful storage box. No matter how far you are going to stretch your piercings - you will find a perfectly suitable taper set here at flesh tunnel shop.